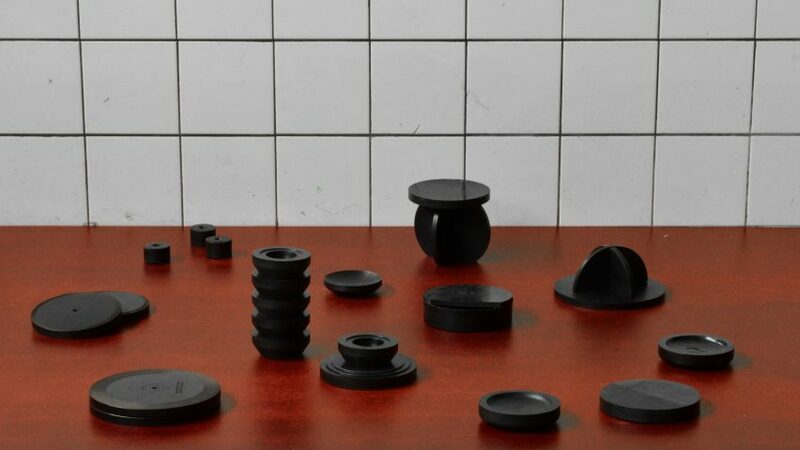 Design Academy Eindhoven graduate Basse Stittgen has used blood leftover from the meat industry to create a collection of small objects. After discovering that slaughterhouses discard billions of litres of animal blood every year, Stittgen wanted to explore whether this liquid could instead be used to manufacture a new, environmentally friendly material. "Blood as a material can mean so many things – it can mean life, it can mean death – but there is no material notion towards blood," the designer told Dezeen. "That is what I'm exploring. Can it actually be a material?" The aim of Stittgen's project, called Blood Related, was to identify the stigma attached to blood, and then work out how to overcome it. "We all have an idea about what blood means to us, what history we have with it and what its purpose might be," he said. "The idea to have objects made out of blood is therefore much more repelling than the idea to eat animal meat, wear animal skin and even put stuffed animals as decoration up on a wall. This aversion comes not only from disgust but also from habit and tradition." The objects Stittgen has created are 100 per cent blood, yet they are black and solid. The designer dried the blood out and created a powder – a process that is commonly used in the production of black pudding. This powder can then be heated and pressed, and the glue properties of the albumin protein allow act as a binding agent. "The material that results is a protein-based biopolymer," said Stittgen. Using this process, the designer created a series of objects that play on different associations towards blood. They include a jewellery box for storing valuable items, eggcups that can be stacked up into a totem, and a record that plays the heartbeat of a pig. One of the biggest challenges of the project, Stittgen said, was sourcing the blood. He collected it from a slaughterhouse he claims is "quite bio", as it works in partnership with local farms. But was still struck by the violence of the industry. "I'm a consumer of meat products, so going to the slaughterhouse and collecting the blood myself was an important step for me," he explained. "This is a biomaterial, but it is a biomaterial coming out of a really big industry that is connected to so much negativity and violence," he continued. "To work with this material as a designer, I had to see the animals being killed." However, Stittgen said he had received a surprisingly positive reaction from friends who are vegetarian or vegan. "Ultimately, I wouldn't have come up with this idea if the situation didn't already exist," he said. Stittgen presented his project at the Design Academy Eindhoven graduation show, which took place from 21 to 29 October 2017, as part of this year's Dutch Design Week. Stittgen suggested that, by overcoming the stigma surrounding blood, his project could easily be applied on a larger scale. "Blood is something really valuable, really precious, but in the reality of the slaughterhouse industry, it is a gigantic waste," he said. "We have to work with this somehow."